Squeaky Books: Order! Order! I will have order! Heh. I really think this blog post title is clever because it has a double meaning. Gasp! Enna Isilee! What kind of book lover are you?! 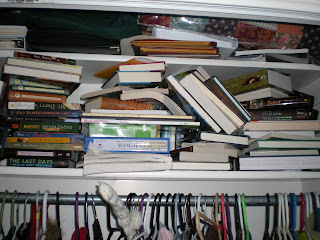 To let your books fall into such disarray is shameful! This picture actually makes it look bigger than it truly is. *Twentieth Century Fox Theme* My New BOOKSHELVES! Aren't they gorgeous?! I got them at IKEA for only $101.44! I'm so excited. You can tell by how I'm breathing in the video. Plus, you can see that I gave Shannon her own section (even though that means her books aren't exactly in alphebetcial order). I'm a bit nervous though, because they're already almost full! WOO HOO! I'm excited! I'm having a hard time deciding if I should read Everlost or Cybele's Secret first. I think I'll read Cybele's Secret. Em, My bed is right by the shelves, so I stand on it to get to the top. 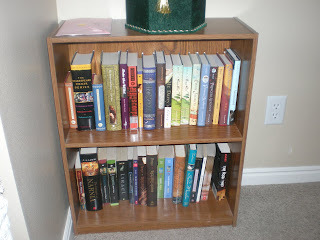 Q, I DO have a lot of books! I'm going to take a new inventory of them today and see how many their actually are. Woah! Major "They're There Their" misuse! I so love your bookshelves. Mine is much too small. Yeah grammatical mistakes! I actually like seeing them. It reminds us we are all pleasantly human. Hooray for you! 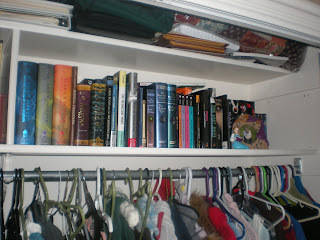 You know I love books and when I buy more, I just have to buy more bookshelves! You'll have to fight with your aunt to see who will inherit mine! Maybe the person with the most bookshelves? I think I could take her down, G. After all, I am Orange Crush.